Orissa extends from 17-degree 49 N to 22-degree 34N latitude and from 81-degree 27-E to 87- degree 29ŏ E longitudes on the eastern coast of India. It is bound by the States of West Bengal on the North East, Jharkhand on the north and Chhatisgarh on the West, Andhra Pradesh on the South & Bay of Bengal on the East. Morphologically Orissa can be divided into five parts. The coastal plains of Orissa stretch from the Subarnarekha in the North to Rushikulya in the South. They are narrow in the North, widest in the middle, narrowest in the lake Chilka coast and broad in the South. The coastal plains are the gift of six major rivers, which bring silt from their catchments, has reclaimed this area from the depths of the Bay of Bengal. The rivers from North to South are the Subarnarekha, the Budha Balanga, the Baitarani, the Brahmani, the Mahanadi and the Rushikulya. The coastal plains can be termed as a land of Ŏsix deltasŏ of the Subarnarekha and the Budha Balanga, the middle coastal plains the combined deltas of the Baitarani, the Brahmani and the Mahanadi and the South coastal plains (The Rushikulya plains). The elevation ranges from 610 to 1, 068 meters. are lower in elevation than the plateaus. They vary from 153m. to 305m. They are the products of continued river action, are rich in soil nutrients, and are situated in the Koelsankh basin of the upper Brahmani in the IB, the Suktel and the Tel of the middle Mahanadi and the Sabari basins. 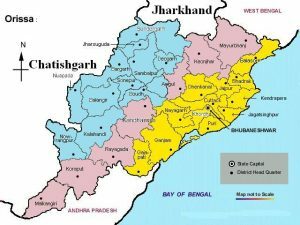 The rolling uplands may be grouped as follows : the Rajgangpur uplands, the Jharsuguda uplands, the Bargarh uplands, the Bolangir-Titilagarh-Patnagarh uplands, the Bhawanipatna uplands, the Malkangiri uplands and the Rairangpur uplands. These are net product of the action of rivers. They are fertile and at times present an undulating topography. The lands of Orissa are irrigated by many large rivers and their tributaries. While some of them originate in Orissa itself, River Mahanadi is the largest river of Orissa and the sixth largest of India, originates from the Holy Amarkantak Hills of the Bastar Plateau lying in the state of Chatisgarh. But unlike river Bhauda and river Vamsadhara, Mahanadi forms almost all of its catchment area in Orissa while the former ones Originates from Orissa but irrigates the land of other states. Brahmani River is the second largest river of Orissa, River Koel and River Sankh merges into one at Ved Vyasa near the steel city of Rourkela to form River Baitarini. reveal all the peculiarities of peninsular tablelands. They are almost flat and the monotony of orography is interrupted by the river valleys. These features are commonly met within the upper Baitarani and the Sabari basins of the Keonjhar and Koraput Districts, respectively. In these uplands sheet erosion is most common while gullying is confined to the river valleys. These plateaus can be divided into the Panposh-Keonjhar-Pallahara plateaus and the Nawrangpur-Jeypore plateaus. The flood plains are the most fertile lands of the state. The heavy rains of monsoons bring in flood in many regions of Orissa as most of the rivers of this state flows beyond their normal level during this season. The accumulation of the soils eroded by floods every year has resulted in the fertile lands in forms of Flood plains in Orissa. Most of the agricultural activities of the state takes place in these plains.